Phalange Party leader Amin Gemayel discussed at length on Wednesday with the head of the Syrian National Coalition George Sabra the kidnapping of the two bishops in Syria’s Aleppo region, reported the National News Agency. 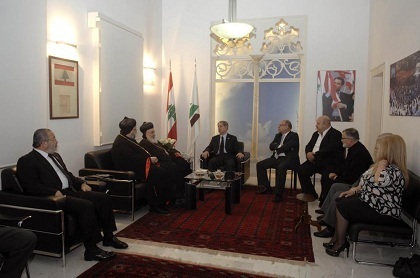 It said that Gemayel received assurances during the telephone call that the clerics are in good health. Sabra revealed that they are being held by a small group in the town of Bishqatin 20 kilometers northwest of Aleppo. “Their abduction is not a very comforting message to Christians in the region,” he remarked. “Their kidnapping contradicts with the announced goals of the Syrian revolution,” he added before a delegation of Syriac clerics and officials. Aleppo’s Greek Orthodox Bishop Boulos Yaziji and Syriac Orthodox Bishop Yohanna Ibrahim were kidnapped on April 22 by armed men near Aleppo while en route from the Turkish border.